What do you think of this Ham Dogger? Now you can please both the hot dog and hamburger lover when grilling! You will never have to buy two kinds of buns again when you have the Ham Dogger in your kitchen. This fun and unique tool is easy to use and makes 1/4 lb. 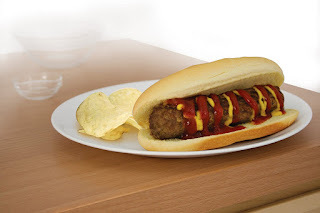 hot dog-shaped hamburger patties. Spice it up, and make specialty dogs using ground sausage or turkey--or add other ingredients! Utilize this handy gadget at your next barbecue for food that will be the topic of conversation for your guests. Check it out! ~~ Read the reviews! Good idea - or - Waste of Money? March 21st - Featuring Fairy Freebies!